AP: Tell us about your journey from -- in your words -- Loserville to Awesome City. Sincero: My big journey was around money. I was a successful writer, I was a musician but I was just always broke. Into my 40s, I was scraping by. I finally just got so sick of it. That’s when I really put my nose to the grindstone and started learning everything I could about changing my life. One of the issues, which I’ll write about in my new book, is my dad. One of the ways that he showed me he loved me was giving me 20 bucks. Deep down in my heart I felt like if I made a lot of money my dad wouldn’t feel like he’d be able to show me he loved me because I wouldn’t need him anymore. The other side of that was, I wanted money. I was sick of living in a converted garage. AP: What has happened to this country where we feel the need for life coaching so intensely? You say your first life coach, who cost loads of money, turned things around. Sincero: It’s probably like however therapy started. From my experience, there were things that I was trying to do on my own, namely making money and building a career for myself, that I was just sucking at forever. Whenever it did originate, where you get that outside help from somebody, it’s so profoundly quick and so much easier, that I can see why it took on like wildfire. I’m so damn glad I did it. AP: Let’s talk about the G-word, otherwise known as god. Can we be successful without him/her/them? Sincero: You know, I was such a skeptic about that. There are people walking around right now who are successful who don’t give a crap about god. For me, I feel like god is intuition and an inner knowing, I think it’s difficult to be successful without that because that’s where you have to come from if you’re really going to knock it out of the park. For me, it’s more a sort of a universal energy. That’s one of the things I had to start wrapping my mind around. 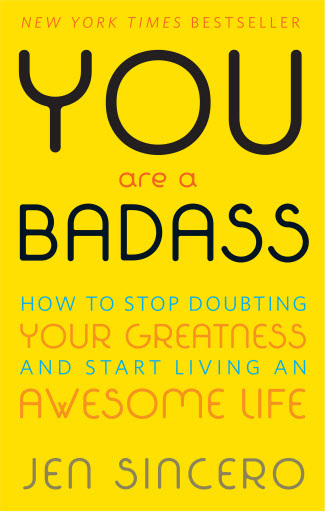 AP: What are you saying in this book that hasn’t been said many times over -- numerous inspirational quotes and all? Sincero: To be honest, I don’t think I’m saying anything all that brand new. I think I’m just saying it in a new way. You know, one of the motivations for me writing this book. I’ve read like 10,000 self-help books. There was nothing that was kind of funny and curse-y and irreverent, and I was like, man, that’s what this industry needs. You can read the same thing a hundred times but somebody can say it in a certain way and suddenly everything changes. That’s sort of what I wanted to do with this book, was to not only make it entertaining but to give somebody who wasn’t quite getting it the opportunity to get it from a different voice. AP: How can I truly know that the universe is totally freaking out about how awesome I am, as you write? Sincero: For me, it’s through meditation. It’s one of the coolest damn things I’ve ever done. When you really get into it, you start to connect with this feeling that you really are part of this energy. When I meditate, I can feel an energy that is much bigger than me but is also part of me, and it’s a very powerful energy.